Juliana and Tim’s wedding was stunning from the wardrobe to the details to the decor. These two were so easy going on their wedding day. They put their trust in us when it came to the photos, and we had such a great time with both of them. We love the rooms at the Simsbury Inn for bridal preparation. The light is always pretty and the decor makes a beautiful backdrop for a bride. Juliana’s dress was AMAZING! Front and back it was stunning and Tim’s reaction to seeing her was priceless. Tim is usually cool and collected. I don’t think going into their first look he expected to be so blown away. It was an incredible moment to witness. After their first look, we wanted to give these two a little time to enjoy each other and relax a bit before the ceremony. We are local to the Simsbury area and know it well. We took them offsite to one of our favorite places for photos. Their portraits are stunning, and we are so happy they were able to get those moments together. Soon after all the photos were complete the rain made a quick debut. Fortunately it didn’t last long, but we timed the photos just right. The ballroom in the Inn had an amazing transformation thanks to the ladies at Stylish Blooms. The flowers for the day were gorgeous. Juliana’s bouquet, the ceremony arch, and table settings had a spectacular display of white flowers. The only way to describe this wedding was simply elegant. I loved the ethereal vibe with all the white with the flowers and candles. Although I am a sucker for color, this wedding made me a true believer in a white and black color scheme. 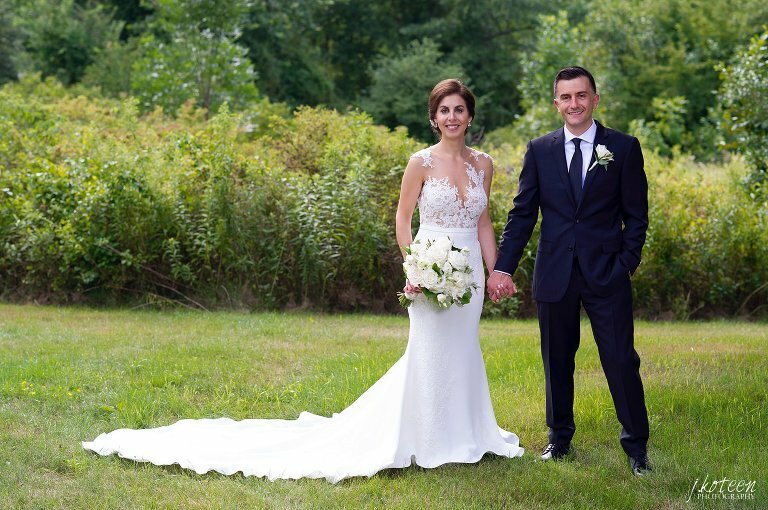 We hope you enjoy looking through the photos and admiring Juliana and her dress!